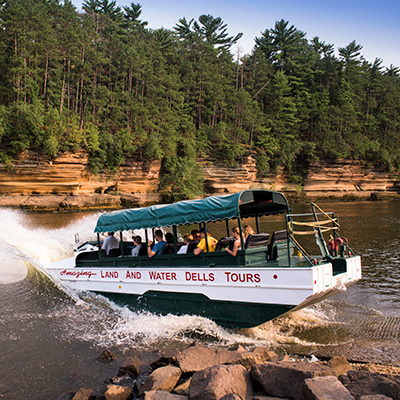 Explore both land and water on the amazing amphibious Original Wisconsin Ducks tour! You will squeeze through the narrow passes of Red Bird gorge, splash down into Lake Delton and see the beautiful rock formations of the Wisconsin River. Throughout the ride, our extensively trained Wisconsin Dells duck drivers will teach you Wisconsin history and have you rolling in the aisles. If you have not done the Ducks, you have not done the Dells! Save on Original Wisconsin Ducks tour tickets in Wisconsin Dells when you purchase from Passport To Savings. Order online and start saving today!